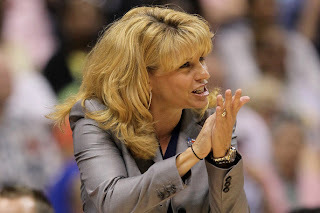 NORMAN, Okla. -- University of Oklahoma women's basketball head coach Sherri Coale has been appointed to the Kay Yow Cancer Fund Board of Directors, the fund, in association with the Women's Basketball Coaches Association (WBCA) and The V Foundation, announced Thursday. "Like many others, I am privileged simply to have been in the presence of Kay Yow and am elated to help extend the trail blazed by her legacy," Coale said. "The impact of the Kay Yow Cancer Fund has grown immeasurably as it has aided funding for significant research for fighting this dreadful disease. I am truly proud to serve its mission." Coale joins Penn State head coach Coquese Washington and ESPN Vice President for Programming and Acquisitions Carol Stiff as three additions to the board beginning Sept. 1, 2012, responsible for the strategic leadership and governance of the Kay Yow Cancer Fund. "We are pleased to add such strong advocates to our existing leadership on the Kay Yow Cancer Fund Board of Directors," Kay Yow Cancer Fund Executive Director Sue Donohoe said. "Sherri, Coquese and Carol have each been tremendous supporters of the Fund and we look forward to working with each of them in an even greater capacity." Coale is heading into her 17th season at the Sooners' helm, boasting a 357-168 record at Oklahoma. During her tenure, Coale's teams have accumulated 10 Big 12 Conference regular season or tournament titles, 87 Academic All-Big 12 honors, four Academic All-America Team Members and 13 consecutive NCAA tournament appearances, including eight Sweet 16 and three NCAA Women's Final Four trips. "The leadership of the Kay Yow Cancer Fund plays such an integral role in its growth," Connie Rogers-Newcome, the fund's president, said. "We are excited to add these three individuals, who have already demonstrated amazing support and leadership in the fight against women's cancers, to the Board of Directors." The fund has risen more than $6.7 million and granted $2.5 million for scientific research and related programs focused on women's cancers since its inception in December 2007. The 20 members of the Kay Yow Cancer Fund Board of Directors include: Debbie Antonelli, Women's Basketball Analyst; Geno Auriemma, University of Connecticut Head Women's Basketball Coach; Beth Bass, Women's Basketball Coaches Association Chief Executive Officer; Nikki Caldwell, LSU Head Women's Basketball Coach (Treasurer); Nora Lynn Finch, ACC Associate Commissioner for Women's Basketball Operations and Senior Woman Administrator (Vice President); Rosa Gatti, ESPN Senior Vice President; Stephanie Glance, Illinois State University Head Women's Basketball Coach (Past President); Mark Graham, Waverly Hematology Oncology; Jill Pizzotti, DePaul University Assistant Women's Basketball Coach (Secretary); Connie Rogers-Newcome, Adhesives Research Executive Account Manager (President); Marsha Sharp, Texas Tech University Assistant Athletics Director, Pat Summitt, University of Tennessee Head Coach Emeritus; Nick Valvano, The V Foundation Chief Executive Officer; and Susan Yow, Belmont Abbey College Head Women's Basketball Coach. The Kay Yow Cancer Fund was officially founded on December 3, 2007, from the vision of the organization's namesake Kay Yow, former North Carolina State head women's basketball coach. The Kay Yow Cancer Fund is a 501 (c)(3) charitable organization committed to being a part of finding an answer in the fight against women's cancers through raising money for scientific research, assisting the underserved and unifying people for a common cause.